Reality star Kim Kardashian and her daughter North West head to her husband Kanye West's concert in New York City, New York on September 5, 2016. The two were in matching outfits, but instead of heels, North wore flats. Kim Kardashian styled her high-shine dress with on-trend clear mules by Yeezy. 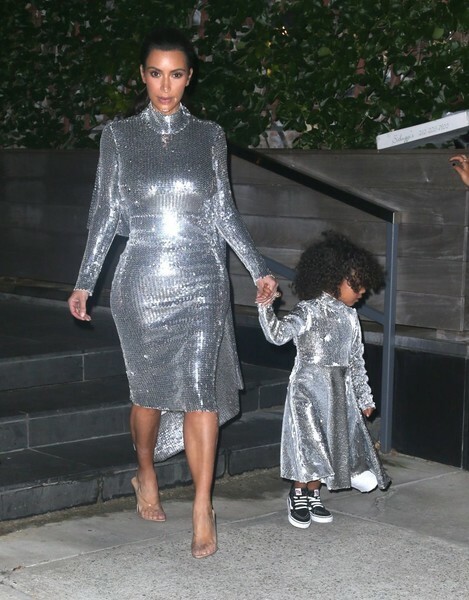 Kim Kardashian and her mini-me caught plenty of admiring stares when they stepped out in New York City wearing matching silver Vetements sequin dresses. Cute!